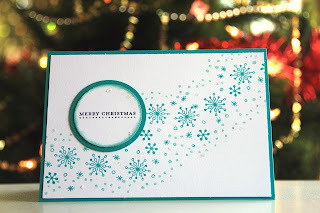 CreativemarzCardz: Remember that old stampset? So, do you remember that one stamp set you bought and used a few times to make a calendar or two and now overlook because you have so many new stamps? Well, I decided to grab an oldie today. I loved making perpetual birthday calendars with this stamp set, but it's also very well suited to making backgrounds! I wanted to make a couple of Christmas cards without using special Christmas (Autumn/Winter Catalogue) sets. I want to do a series on this theme. To start, I made these ones with Bermuda Bay paper and ink. I used the Perpetual Birthday Stamp set and the No Bones About It stamp set (for the dots on the outside of the pattern). The last stamp set is the Teeny Tiny Sentiments, which is where the "Merry Christmas" sentiment is from. 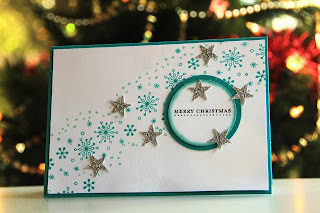 I dotted the first card with silver glimmer paper stars punched out with the Itty Bitty Punches Star and dotted the second one with Dazzling Details (they're hard to see on this photo) to give the cards a bit of dimension. I used the 2" and 1 3/4" circle punches for the Circles in the middle. I also stamped the insides and the envelopes of course, but didn't take pictures! Never forget to coordinate, right? Well, I hope you feel inspired! Hope you'll join me next time for my next Christmas but not Christmas Card.